American exceptionalism. Those two words conjure such disparate emotions and perspectives that they beg further analysis and explanation, especially this time of year when we celebrate that exceptionalism and its role in history. For it all started 235 years ago this week, and was codified in a document which some in this nation now consider irrelevant. Contrary to what some among us erroneously assume, American exceptionalism is not some obtuse reference to Americans being any better than anyone else in the world. It doesn’t mean that our products are somehow superior, or that we’re any more erudite than the inhabitants of any other country. It simply means that, as a nation, America was exceptional in how it was founded and the precepts upon which it was established are unique and unparalleled. And who, with any modicum of historical perspective, could intelligently argue against that? After all, what could be more unique and exceptional than a nation being established based on inalienable individual and collective rights of life, liberty, and property? In an era when monarchs, rulers, autocrats and aristocrats governed according to their whims and disposition based primarily on caste or bloodline, a motley collection of men steeped in classical-liberal principles led a revolution and established a nation dedicated to individual freedom. That concept of limited governmental power and maximum individual freedom is the embodiment of American exceptionalism and is the reason for our holiday this week. 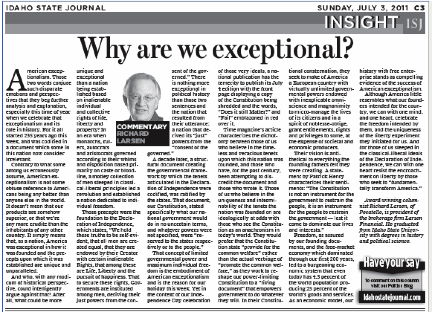 Yet in the context of our Independence Day celebration of those very ideals, a national publication has the temerity to publish its July 4th edition with the front page displaying a copy of the Constitution being shredded and the words, “Does it still Matter?” and “Fail” emblazoned in red over it. Time magazine’s article characterizes the dichotomy between those of us who believe in the timeless and veracious tenets upon which this nation was founded, and those who have, for the past century, been attempting to discredit the document and those who wrote it. Those of us who believe in the uniqueness and interminability of the tenets the nation was founded on are ideologically at odds with those who see the Constitution as an anachronism in today’s world. They would prefer that the constitution state “provide for the common welfare” rather than the actual verbiage of “promote the common welfare,” as they work to reshape our power-limiting Constitution to a “living document” that empowers government to do whatever they will. In their Constitutional consternation, they seek to make of America a European country with virtually unlimited governmental powers endowed with inexplicable omniscience and magnanimity to micro-manage the lives of its citizens and in a spirit of noblesse-oblige, grant entitlements, rights, and privileges to some, at the expense of societal and economic producers. Freedom, as assured by our founding documents, and the free-market economy which dominated through our first two hundred years, led to a burgeoning economic system that even today has 4.5% of the world population producing 25% of the world’s goods and services. As an economic model, our history with free enterprise stands as compelling evidence of the success of American exceptionalism.